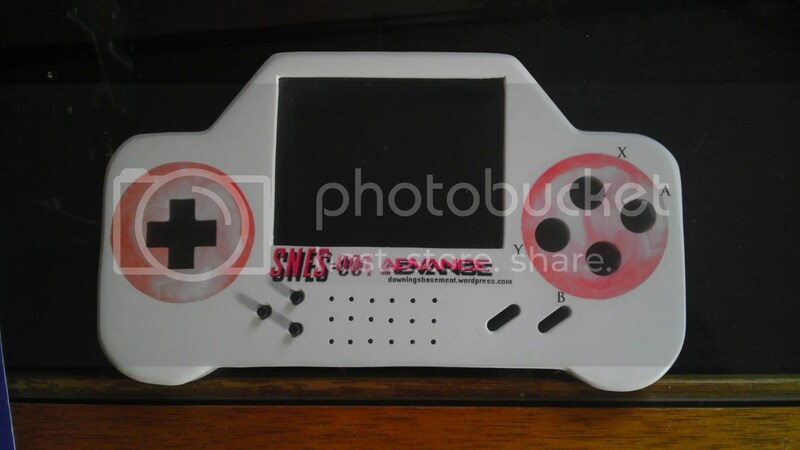 So after some fun tuning up my skills with Adobe PhotoShop and experimenting with a Krylon based Decal paper, I got the first trial of decal prints done on the second controller for the SNES-001 Advance. This controller in it’s layout alone is far ahead of it’s older brother and really will be a much more usable and aesthetically pleasing than its counter part. On top of this, I now have all the external components mounted. I also adjusted the input plugs/jacks of the A/V and power cables, making the A/V a 3.5mm jack & plug and the power a 3/32″ jack & plug. This was done because even though you are easily able to tell which plug is stereo/mono, it was damn near impossible to tell which jack was stereo/mono creating a potential disaster if they got swapped by accident. So now each plug only fits in the proper jack and I will make this adjustment on the other controller as well. As for the decals, I’m most likely going to edit the button decal because I’m not 100% happy with the letter placement as I just kind of guessed at it to begin with. But now that I have a point of reference, I should be able to put them in their proper place. I’ll hopefully be getting more done tomorrow though it’s still supposed to be a beautiful day and I love the sun! But we’ll see and I’ll update when they become available! Cheers!